The ruling party of President Evo Morales, Movement towards Socialism, MAS, is set to win the coming April regional elections with victories in six of the nine departments (provinces) in which the country is divided, according to the latest public opinion poll published by La Paz main daily La Razon. According to the poll, MAS is favoured in the regions of La Paz, Oruro, Potosí, Cochabamba, Chuquisaca and Pando while the opposition remains unmoveable in its strongholds of Beni and Santa Cruz while in southern oil rich Tarija there’s a technical draw. The poll from Ipsos, Apoyo, Opinion & Mercado was taken between February 20 and March 2, having interviewed 2.940 people in over one hundred locations in the nine regions. César Cocarico from MAS is poised to become governor of La Pay with 41% of the vote and the former president of the Lower House Edmundo Novillo with 51% of the vote is expected to win in Cochabamba; Feliz Gonzalez in Potosi with 49% support and Esteban Urquizo in Chuquisaca with 44% of the vote. Luis Flores in Pando is expected to win with 41% of the vote and Santo Tito in Oruro with 27%. In Beni, the current opposition governor Ernesto Suárez could repeat with 44% support followed by a former Miss Bolivia Jessica Jordan, handpicked by Morales with 25% vote intention. In Santa Cruz province the richest and most prosperous region of Bolivia Ruben Costas from the opposition is ready for a second mandate with 58% support while the MAS candidate Jerie Justiniano figures with 26%. In Tarija there’s a technical draw with 37% vote intention for MAS candidate Carlos Cabrera and 37% for opposition hopeful Mario Cossio. According to Bolivian legislation those governors running for re-election had to resign last January. Besides the nine governors, Bolivia will be voting on April 4 for 144 members of regional assemblies; 337 mayors and 1.887 Councillors and 23 indigenous authorities. Evo Morales the first indigenous president elected in Bolivia reformed the constitution and was comfortably re-elected for a second term. 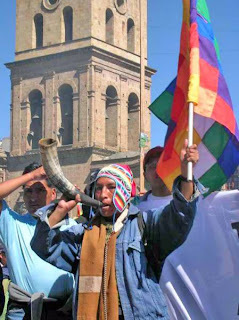 His reforms to compensate “centuries” of indigenous exploitation have triggered reactions from the richest provinces under political control of the Spanish descendents, but Morales continues with strong support and has managed a relative stability in a country with a long tradition of political upheavals.